With a short 5hr morning trip, McFire headed out at 05h00 this morning into some nice conditions, fortunately the sea had settled nicely after yesterdays pumping NE wind and a light SW made for an ideal day offshore. 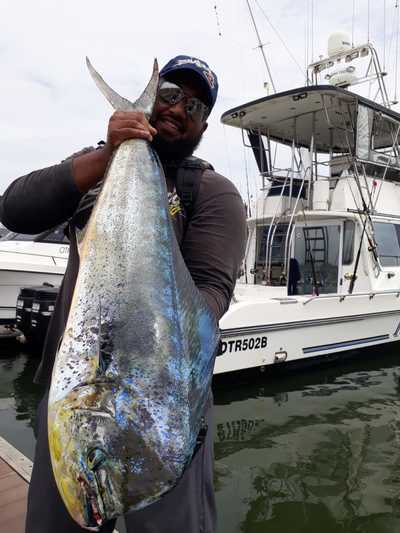 There was not time to be wasted as a mix of Game and Bottom fishing was requested for today and so lines were set straight from port and before all the lines were out the first Dorado was on and after a good fight it was on deck sealing the mood for a good trip. 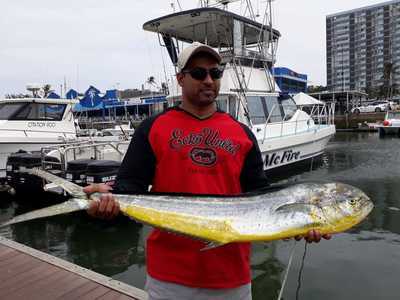 There was also other Dorado that got caught and a Bonnie, a wide variety of bottom fish where caught, all undersize ones were put back. A very successful morning with a happy crew. Back on the dock just after 10h00.